Los Robles Greens Hole 5: A good downhill driving hole with OB and bunkers left and fairway that slopes heavily to the right. However, about 80 yards from the green is a large oak tree that will make the uphill approach blind if played from too far to the right and impossible if too close to it. The well-bunkered green is also very tough to putt. Los Robles Greens Hole 6: The signature par 3 hole is downhill to a large sloping green, and the distance is tough to judge. 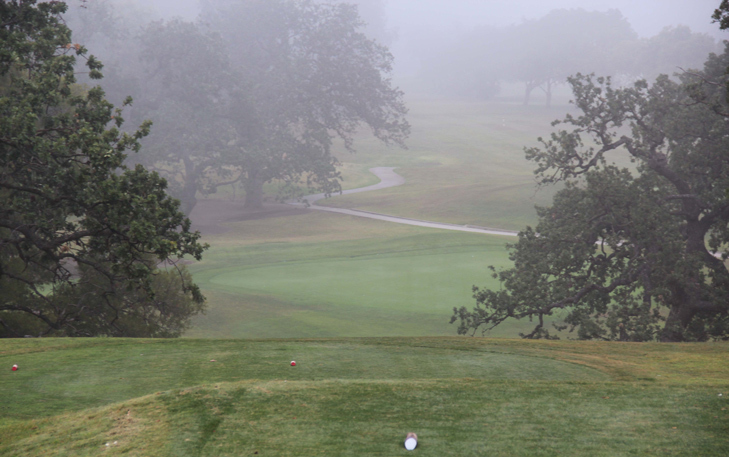 There are enough oak trees that will catch or deflect errant shots, leaving a difficult chip, as the green is raised. Also, this hole gets the award as one of the most visible tee boxes from a freeway. Los Robles Greens Hole 12 (left): This short par five is a good chance to score of the drive can cut off as much of the dogleg left as possible without going too far left. The green does slope strongly from left to right and back to front. 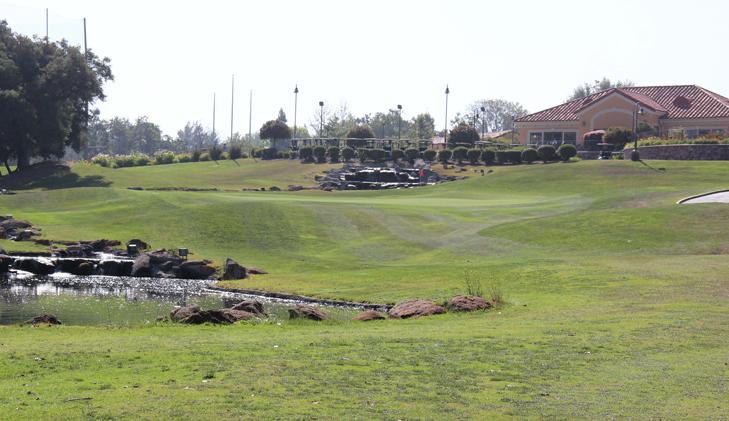 Los Robles Greens Hole 14 (below): A mammoth dogleg right par 5 that must be mentioned as it is 611 yards. The only real danger from the tee is for the too bold who tries to carry the corner of the dogleg and fails. The rest of the hole is flat and straight, but there is a deep hole (formerly a lake) left of the fairway about 150 yards from the green, which is tough to negotiate as the fairway pinches in there as well. Los Robles Greens Hole 15: A very solid uphill par 4 golf hole with a narrow and difficult drive. Any pulled shot will be blocked by a hill and anything right will be in the trees. The second shot is way uphill over a stout oak tree in the middle of the fairway. A large hill left of the green will leave difficult pitch shots to the green that slopes severely from back to front but missing right will bound the approach shot down a tree-filled hillside. Los Robles Greens Hole 17: This long, slight dogleg right par four has an elevated tee shot that offers as nice of view as one will find on Los Robles. However, an accurate and lengthy drive is needed (a miss to the right is worse than left) to allow a good shot at hitting the angled and deep green. 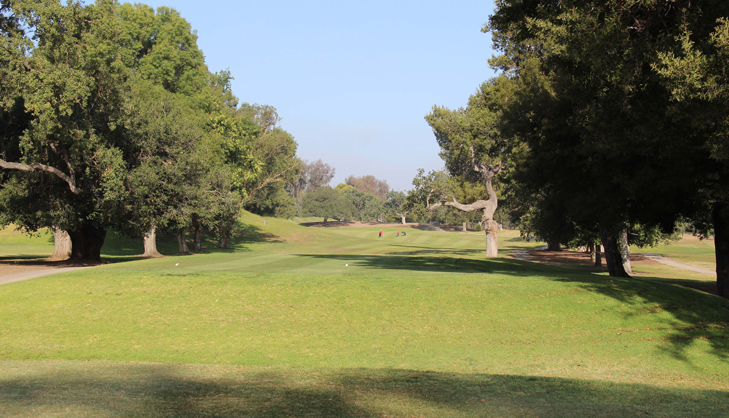 Los Robles Greens Hole 18: The last drive of the day is sinister as it features a wall of trees to the left and OB to the right. It is also very tight and any drive not getting at least to the 150 yard marker or going left will be blocked by the last of the trees. The long drive must also be careful as there are bunkers right and a lake to the left beyond the last tree. The lake starts as a waterfall behind the green, which wraps left around the green, although there is a little room to still miss left of the green before getting wet. 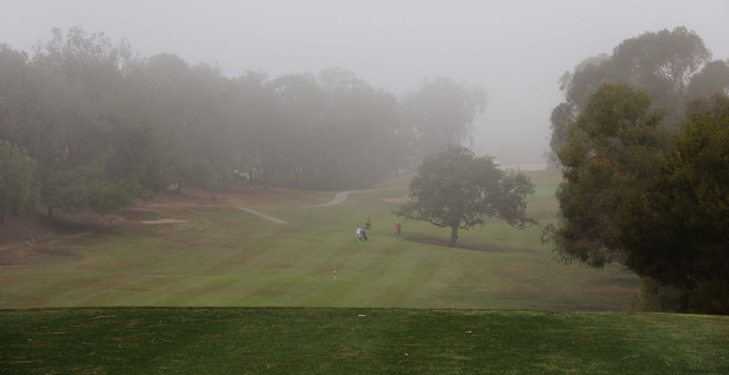 other Ventura County Golf Courses.